Hauskaa lauantaita, tervetuloa viikon Allsorts haasteen pariin! "Kimallusta" halutaan nähdä nyt haasteessa! Tämä sievä keijukaisleima on ollut yksi kesän suosikki. Nyt oikein kimaltavin siivin. Hi; Happy Saturday, it's time for a new Allsorts Challenge! "Sparkle" is the theme. 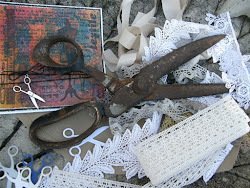 WOC roses ribbon and seambinding. Tiny clear rhinestones. Wooden text "congrats". She's a very saucy looking image Mervi an looks great against the pretty die cut background. Mervi this is just so beautiful. Loving the the fabric flowers and the sparkly touches on her wings. 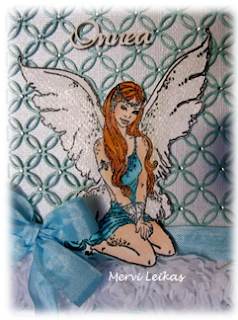 Beautiful card and love all the glitter on the wings and the embossing folder. I've been away on holiday and I've just finished looking at what you've been up to while I was away. So any wonderful cards. This card is beautiful, I love the added texture, fluffy, like angel's wings. A gorgeous card Mervi, a super design with the fabulous background die.....your image is desighful, beautifully coloured and glittered along with gorgeous details!! Samalla toivottelen kaimaselleni Hyvää Nimipäivää! This is so pretty! Thanks so much for playing along with us over on the Simon Says Stamp Wednesday Challenge blog! Ihanan upean herkkä. Todella kaunis kuva. Mukava, että osallistuit meidän kimaltavaan haasteeseemme Wags 'n Whiskers -sivustolla ja onnea arvontaan.